When is a recording studio not a recording studio? When it’s a bog-standard classroom with some gear in! Howard Turner from Studio Wizard looks at what it takes to make a proper educational audio facility, and how recent regulations should have spelt the end for shoddy school studios. If your PE teacher was given a swimming pool full of mud, and told that this was the ‘new purpose built facility for gymnastics’, you’d probably forgive that colleague for getting more than a little upset! However at the commencement of each term, we get calls from schools and colleges where equally inappropriate spaces have been foisted on Music Departments claiming to be ‘Recording Studios’. We know it’s wrong, you know it’s wrong, and now the government have given us the means to do something about it! Since July 2003, new approved Document E of Building Regulations came into force. Since then, all new school facilities must meet strict standards for noise levels, sound insulation and room acoustics. These standards are set out in DfES Building Bulletin 93 “Acoustic Design of Schools” and cover all areas of schools, including music & drama facilities, and in great detail, recording studios & control rooms. If your school is planning a recording facility, you need to know about this, as a non-compliant facility could be forced to close! 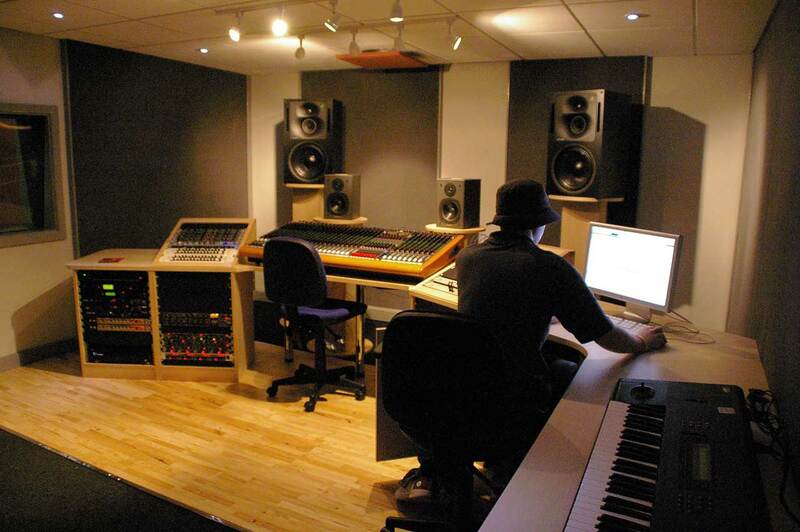 A typical commercial ‘home studio’ facility. So, what is so important about studio acoustics? Well, every sound we hear is coloured by the environment in which we hear it. We all know that for an art space to work (be it painters’ studio or gallery) the lighting has to be balanced and neutral so that the eye can perceive the subject and/or picture. By the same token, the sonic qualities of a studio control room must be understandable and neutral. Our aim is simply to create a room whose characteristic sound we understand almost instinctively. Hardly surprisingly, it appears that the sort of room we understand is one whose sound characteristics closely ape those of an idealised domestic sitting room. Add to this a need to exclude distracting background noises and stop our endeavours affecting the occupants of adjacent rooms and we have described the basic criteria; Room Acoustics and Isolation. These two issues are not one and the same. In fact one makes the other worse. Once you’ve ‘Isolated’ and trapped all the sound inside a room; it’s going to rattle around in there and sound awful unless you do something about the ‘Room Acoustics’. After all, if we cannot understand what is coming out of those speakers, how can we hope to balance the instruments and vocals in a mix, with the room forcing some to the fore, and masking others? Similarly, how can we demonstrate manipulation of sound when each listener in the room is hearing something different? So, control rooms have to have a standardised acoustic in terms of reverberation & background noise (from outside and from ventilation), and out of respect for our neighbours we have to keep our sonic excesses in. 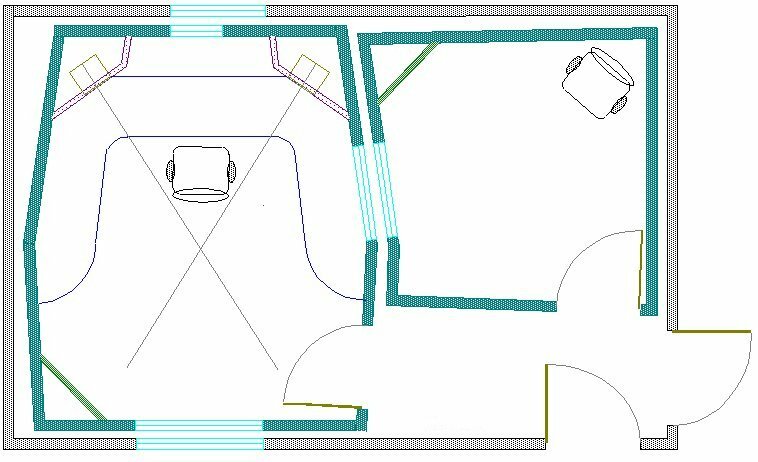 Live recording spaces might by contrast benefit from a variety of acoustics ‘colours’, however the issue of control of noise ingress and egress is even more to the fore. A virtual overview of an educational facility. One room stereo, the other 5.1 surround. A Bluffers Guide to Studio Building. So, your institution has a grand plan to provide a studio facility – the pictures will look great on the prospectus. But how can you be sure that they have recruited the right team to design and build it? Well almost without exception, if the design/build team chosen are a local architect and conventional builder, they will not have the skills to create a workable facility – large parts of their training teach them ‘unbreakable golden rules’ which must be broken in order to create a studio. If they have not got a studio acoustic consultant on board supervising (not any old noise consultant, but a bona fide studio specialist) then certainly the project is doomed. If you are offered a pre-fab for your studio complex, it will be incapable of providing compliant studio isolation and noise control unless conventional studio techniques are used inside, with the pre-fab just keeping the rain out. Building tender processes, common on school projects, are based around setting up an adversarial relationship between designer and builder, whereas in the studio world, each designer has pet ‘teams’; who understand his/her designs and will build them appropriately, cooperating closely with the designer at all stages. Competently defined tender documentation is essential if the process is not to end in tears! 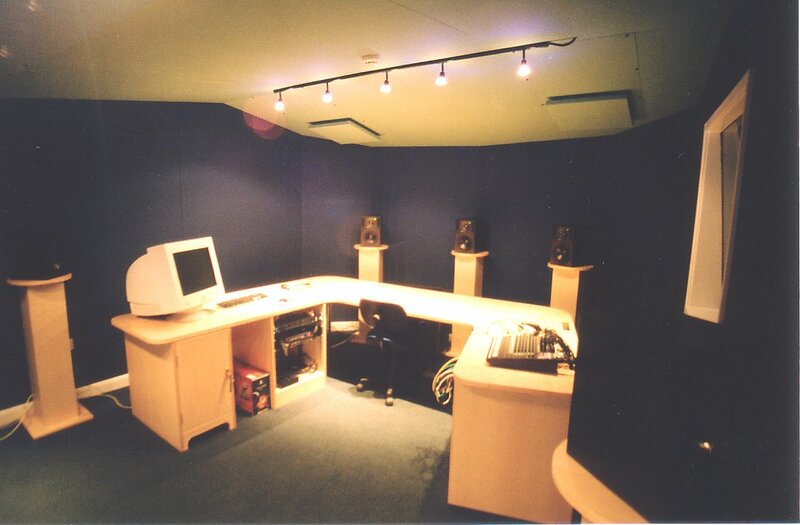 A surround sound teaching control room NSAD Norwich. 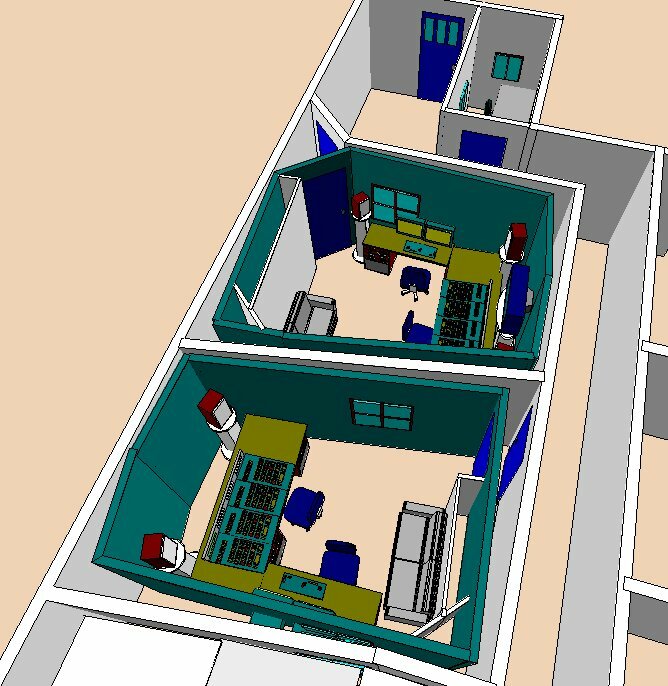 Are there drawings of isolated ‘rooms within room’ designs? Are the walls, floors & ceilings at an angle to each other, i.e. non-parallel? Has the designer drawn in the orientation of the equipment (especially the monitor speakers)? Is the end of the room with the speakers in it symmetrically laid out? Are there only soft surfaces on the walls beside the speakers? Are there indications of acoustic treatments on all surfaces, including ‘bass traps’? Are there reverb times specified across different frequency bands (there may be 6+ separate figures) in the finished room? Are there background noise figures specified for the finished studio rooms and the adjacent non-studio spaces? Is there evidence that the air conditioning system (there must be one to be legal) has silencers to control ventilation noise and also leakage between studio spaces? Are there double sound lock doors into the studios (i.e. where you enter one door & close it before opening the second)? If the answer is ‘no’ to any of these questions then you need to proceed with extreme caution! Don’t be afraid to ask an independent consultant to vet the designs and offer comments. And if the building is already under construction, don’t rely on council Building Control to test the rooms for you – they may be unaware of the requirement, and reluctant to hire in the necessary skills. In the recent years we in the studio build industry have seen tens of millions of pounds of public money wasted on ill-thought-through school studio projects, when just the same amount of money could have delivered excellent facilities. These cases range from a normally built classroom with a plaque saying ‘Studio’ on the door, to purpose built multi-million pound new structures where every acoustic rule has been broken, and where remedial work is all but impossible owing to fundamental design errors. 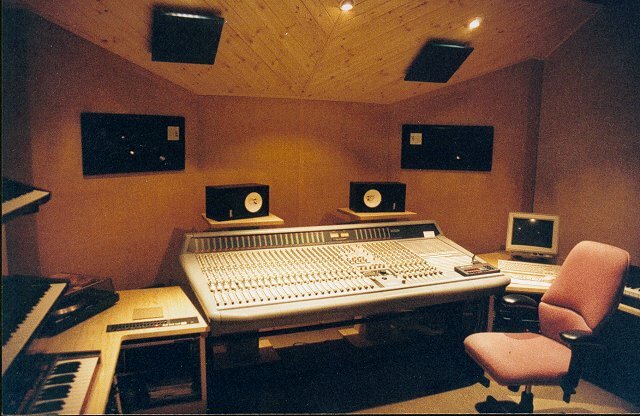 Typical Small Studio Layout showing offset walls, & a symmetrical monitoring environment. “Each room and other space in a school building shall be designed and constructed in such a way that they have the acoustic conditions and the insulation against disturbance by noise appropriate to its normal use”. The most important advice is there in BB93 too: use a specialist, and get them involved as early as possible. A final word fromAdrian: “No designer has yet been taken to court for failing to meet these standards.” But as spend on school studio facilities rises, it can only be a matter of time…. BB93 is available on paper as ISBN 0 11 271105 7 from the Stationery Office (www.tso.co.uk). Or can be downloaded free of charge from the DfES website www.teachernet.gov.uk/acoustics.